Sign up for custom Water Alerts by text or email. LOCATION.--Lat 40`57'41", long 78`31'10", Clearfield County, Hydrologic Unit 02050201, on left bank 30 ft downstream from bridge on State Highway 453, 0.8 mi downstream from Curwensville Dam, 1.1 mi south of Curwensville, and 1.8 mi upstream from Anderson Creek. PERIOD OF RECORD.--October 1955 to current year. GAGE.--Water-stage recorder and crest-stage gage. Datum of gage is 1,124.66 ft above National Geodetic Vertical Datum of 1929. Prior to Aug. 24, 1956, nonrecording gage and crest-stage gage 30 ft upstream at same datum. COOPERATION.--Station established and maintained by the U.S. Geological Survey. Funding for the operation of this station is provided by the U.S. Army Corps of Engineers, Baltimore District, the Pennsylvania Department of Environmental Protection, and the U.S. Geological Survey. 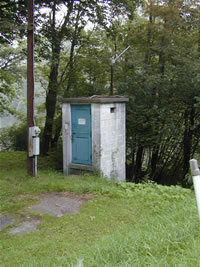 REMARKS.--Flow regulated since November 1965 by Curwensville Dam. Supplied by NWS: No flood stage has been determined for this station. This station managed by the PAWSC New Cumberland Office.